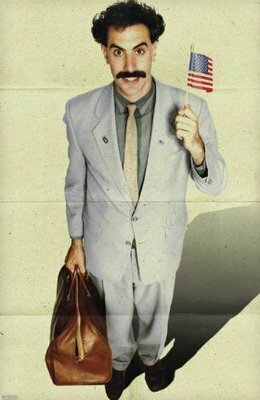 today, we went to the 4:20 matinee of borat: cultural learnings of america for make benefit glorious nation of kazazhstan. the theatre was packed, though i'm not sure how many of the people there really knew what they were in for. the movie was everything i hoped it would be. as fans of da ali g show know, the genius of borat is not in the horribly racist, sexist, and anti-semitic things he says, but the way that people react to him. most of the people in this movie are not actors: they are real, "normal" americans who take borat at face value, not realizing he's just a character. they react to borat in fascinating (and sometimes horrifying) ways: some react with hostility, some just smile and try to ignore his bigotry, and some—shockingly—agree with him, proving themselves as ignorant and bigoted as borat himself. kazakhs are not the ones who come off like the biggest fools in this movie: the americans are. this style of street comedy seems pretty popular these days, at least on cable networks. but nobody does it as well as sacha baron cohen, and borat is his most effective character. most people aren't willing to take much guff from an annoying puppet, but they'll take a surprising amount from someone they think is a foreigner from a backward country.